OK, we went to Tulsa last night (Friday) to go to Olive Garden for Emily's birthday dinner. We decided to go to Target afterward, since we don't have a Target in Wagoner. We were having a great time looking at all the junk they sell, since it is slightly different junk than what Wal-Mart sells. 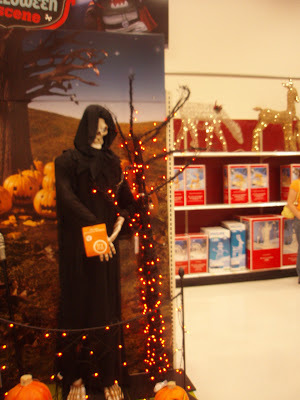 Then we came to the "seasonal" aisle. 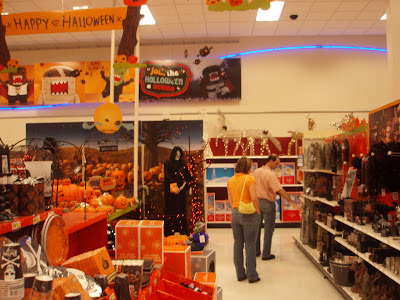 All the Halloween stuff was there, which I suppose is appropriate, albeit early, even for Halloween. THEN, we looked up and saw an entire aisle of CHRISTMAS stuff for sale!!! This is way to early even for me! There is just something wrong about seeing the Grim Reaper and animated Christmas reindeer in the same field of vision! Just think of it as a bookmark holding its place until the Halloween goes away. In 6 weeks or so when the shingle clips for lights have already run out, lots of people will wish they'd have bought them in September. It seems ridiculous, but January is right around the corner. Thanks for dropping by! You are welcome anytime.